When a horse rolls you, it’s often because they are feeling hot and sweaty and want to cool off for a minute. 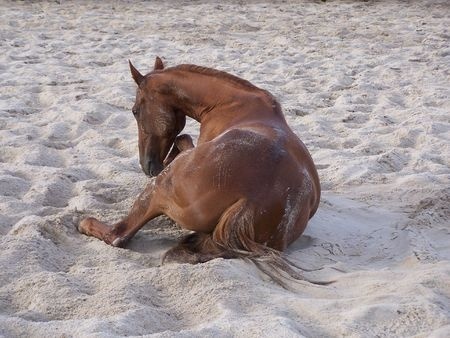 Horses rolling will often drop their legs and lean to the side, so that they can roll around in the cool dirt or mud or dip into water being crossed. When this happens, though, a seasoned rider needs to know to react quickly to jump out of the stirrups and land on the other side of the horse. If a rider isn’t quick enough, he or she could get seriously injured from the weight of the horse. While it’s natural for a horse to want to cool off and roll around in the mud or sand when they’re hot, your horse needs to learn that they can’t do it while carrying a rider. If your horse is prone to rolling, it could be over heating or it could even be due to ill-fitting tack, so make sure that a vet checks your horse while he’s wearing the tack. If it’s not the tack that’s causing him to roll, it is a behavioral choice, and you’ll need to be very firm in teaching your horse that this is not an acceptable behavior, says Equus. As soon as you start to feel the horse roll, you know you should jump quickly out of the saddle and to safety – but it’s important keep your hands on the reins and use them to discipline your horse. Slapping your horse with the reins while he is lying down and after he’s rolled will show him that you’re displeased with his or her action, eventually teaching your horse that this behavior is not acceptable. If you wait until the horse has finished rolling around before you discipline him or her, the horse may not understand that this behavior is unacceptable. Again, it’s a natural way for your horse to cool off when he’s feeling sweaty, so you don’t want to dissuade your horse from cooling off, just from trying to do it while you’re on his or her back. After all, as Horse Channel points out, this 1,000-pound animal could easily crush your foot or leg or, in extreme situations, even crush you to death! For more info on training your horse and other tips on proper horse care, check out more blog posts from Deer Creek Structures. If you’re ready to upgrade or outfit your property with a barn that’s perfect for your horses, check out the barns we have available online now or call us today at 254-546-2276.